The term "transfermium" describes the elements with atomic numbers greater than 100. Fermium is element 100, so transfermium means "beyond fermium." The transfermium elements are grouped together for a number of reasons. First, they are all prepared artificially. None of them occur in the Earth's crust naturally (that anyone knows of). Second, they can be made with only the greatest difficulty. In fact, no more than a few atoms of some transfermium elements have been created so far. Third, very little is known about the transfermium elements. With only a few atoms to study, it is difficult to learn much about them. Still, the transfermium elements are of great interest to chemists and physicists. They help answer questions about the periodic table. The periodic table is a chart that shows how chemical elements are related to each other. The transfermium elements are found at the very end of the periodic table. Scientists want to know if there is a limit to how heavy a chemical element can be. They also want to know what the properties of these very heavy elements will be like. The chart below gives basic information about the transfermium elements. A discussion of the names and symbols in the chart follows in the next section. All transfermium elements are made in particle accelerators, or "atom smashers." A particle accelerator is a machine that makes very tiny particles, like protons or small atoms, move very fast. They often go nearly as fast as the speed of Light. Light travels about 300,000,000 meters per second (186,000 miles per second). The new element, dubnium (number 105), is produced. 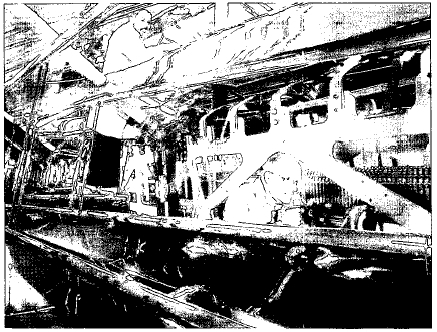 Two men in a particle accelerator. This one is in Strasbourg, France. Research in Darmstadt, Germany. All three laboratories use large particle accelerators that cost millions of dollars. Dozens of scientists from many different countries work on each team. Credit for discovery of a transfermium element is extremely complicated. In most cases, no more than a handful of atoms is produced in an atom smasher. For example, the Dubna group first claimed to have found element 104 in 1964, but many scientists doubted this report. Five years later, American scientists also reported making element 104. This time, the evidence was better. One reason that scientists often argue over the discovery of an element is this: The group of scientists that discovers an element usually has the opportunity to suggest a name for it. For example, researchers at the Berkeley laboratory first discovered elements 97 and 98. They suggested naming those elements berkelium and californium, in honor of Berkeley, California, where the research was done. The final decision about naming elements is made by a group called the International Union of Pure and Applied Chemistry (IUPAC). The decision can take a very long time. The IUPAC spent nearly 20 years trying to agree on names for elements 104, 105, and 106. Finally, in 1997, the IUPAC announced the official and final names for elements 101 through 109. Those names and their symbols are shown in the accompanying chart. The group of scientists that discovers an element usually has the opportunity to suggest a name for it. 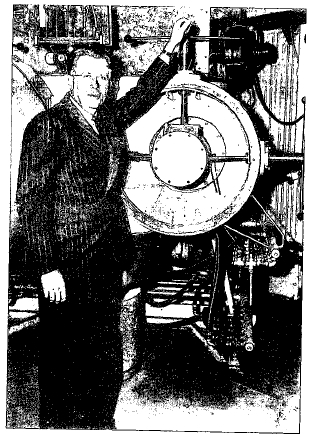 Ernest O. Lawrence, in front of a particle-accelerating cyclotron. Lawrencium is named after him. The IUPAC has not yet assigned names for elements 110 through 112. Discovery of those elements has been announced by the German team. But those discoveries have not yet been confirmed. Therefore, temporary names have been assigned. Those names come from the Latin words for the numbers 110, 111, and 112. They are ununnilium (Uun), unununium (Uuu), and ununbiium (Uub). No one knows much about the properties of the transfermium elements. It isn't possible to see or touch or smell or taste any of these elements. There are often no more than a few dozen atoms to study. In fact, it is quite amazing that scientists know much of anything about these elements. Yet, they do know a few things. In 1997, for example, the German team studied the properties of element 106, seaborgium, with only six atoms to work with! But they managed to watch how these atoms behaved as they slowly moved down a column of special material. Of course, these elements have no uses. Most transfermium elements have more than one isotope. Isotopes are two or more forms of an element. Isotopes differ from each other according to their mass number. The number written to the right of the element's name is the mass number. The mass number represents the number of protons plus neutrons in the nucleus of an atom of the element. The number of protons determines the element, but the number of neutrons in the atom of any one element can vary. Each variation is an isotope. 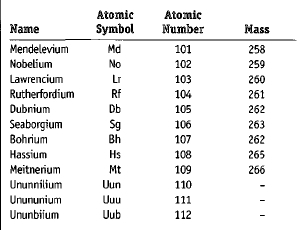 The number of isotopes currently known for each element follows. The numbers may change as scientists discover new isotopes. All of the isotopes of the transfermium elements are radioactive. A radioactive isotope is one that breaks apart and gives off some form of radiation. In most cases, they have very short half lives. The half life of a radioactive isotope is the time it takes for half of a sample to break apart. T he larger an atom is, the more unstable it tends to be. It seems that big atoms have trouble staying together. They tend to fall apart, giving off tiny particles like electrons and protons in the process. When they do so, they change into other, smaller atoms. This process is called radioactive decay. All elements heavier than bismuth are radioactive. They have no stable isotopes. Does that mean that scientists will never find another stable element in the transfermium group? As they search for elements 110, 111, 112, and beyond, will they always find radioactive isotopes only? Some scientists think the answer is no. They believe that some very heavy elements may be stable. Their atoms may be able to stay together, as is the case with lighter elements. One of these elements may be number 114. Scientists think that atoms are likely to be stable if they contain a certain "magic" number of protons and neutrons. Those magic numbers are 2, 8, 20, 28, 50, 82, 114, and 184. So an atom with 20 protons and 20 neutrons, for example, would be expected to be stable. And it is. The next element among the transfermium elements with a "magic" number of protons and neutrons is number 114. One isotope of element 114 could have 114 protons and 184 neutrons. It would have a "double magic" number and might be very stable. Scientists hope to be able to make enough of the element to study. The element might or might not have practical uses. But it would be an exciting discovery for scientists. The half life of most transfermium isotopes is only a few seconds or less. The half life of dubnium-260, for example, is 1.6 seconds. That means that half of the atoms in a sample will break down in 1.6 seconds and change to some other element. Short half lives of the transfermium isotopes makes them hard to study. They tend to break down almost as soon as they are formed. Scientists have very little time to observe them. Very helpful my dudes. I love this website VERY much. Thanks for the clarification.